Jozef Baj passed away at the age of 91. Even although he haven't wrote any books - he left such a great legacy and touched so many lives, he will be remembered not only as a great constructor and maker of superb dowsing tools, but also as a great person and teacher. He left a group of dedicated co-workers and friends whom he passed his knowledge during the over 20 years of working together, so his legacy will continue. When you ask people who use Jozef Baj's pendulums - "what makes them so special?" you get a variety of answers: some will say that his pendulums have a soul, others call them "pendulums with angels", most will say that they just feel right. Whatever the answer - his pendulums are used, enjoyed and admired around the world - in search for water and minerals, lost objects and missing people, but most of all - for healing. 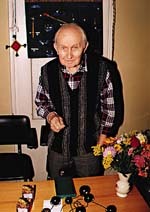 Jozef Baj's adventure with dowsing started under tragic circumstances - in Auschwitz prison camp during Second World War. There he met a Swiss man who introduced him to basics of radiesthesia and he learnt quickly. Being handy with tools he made a few pendulums using just a pocket knife. Dowsing literally saved their lives as they were asked to find a location for a well for the camp - if they didn't - it would become their grave. 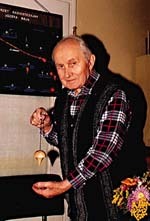 Creating pendulums became his passion. He studied all available materials, specially by A. Belizal, L. Chaumery, P. A. Morel and Enel. He created his version of the Universal Pendulum and quickly it gained a reputation as the best pendulum of its kind. Soon new designs followed based on his research in ancient Egyptian artifacts - Isis - based on the Cross of Life, Osiris, Karnak. magnetic batteries made out of specially selected wood and careful mental coding during the production process, it radiates pure white spectrum without losing its power. (Other Osiris pendulums radiate potentially dangerous negative green). Jozef Baj still creates new pendulums - the set with Schussler's Salts, Lymphatic Massager, a pendulum with Bachs's Rescue Remedies and with some botanicals that are result of the newest research into cancer treatment and prevention. Unique design, great attention to detail, high sensitivity and reliability make his pendulums so desirable. When you meet Jozef in person, you will find an incredibly warm, modest and honest person.